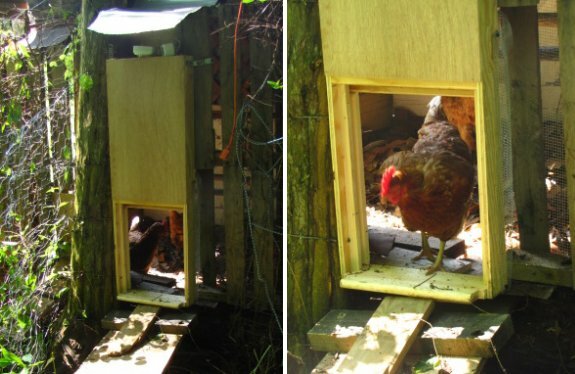 Installation of the automatic chicken coop door can be done with just a few wood screws. Jeremy includes some metal brackets that helped fine tune the door to our latest chicken coop made from pallets. The new automatic chicken coop door came with a timer which makes it easy to set when the flock can go out. I first thought I might try to get one of those dusk to dawn sensor switches, but the coop gets shaded by a hillside that delays the full morning sun by a few hours depending on the time of year. I would suspect the moment when the chickens can first start to see in the dawn light would be a good time to hunt insects that are trying to get home after a full night of crawling around. This might be a good reason to open the door a little on the early side. That way they can decide when there's enough light out to jump off the roost and start foraging. I guess that means there's a chance that a racoon working the morning shift might happen upon the door open, but I think it might be worth the risk if it means the flock gets more protein rich bugs in their diet.